This lively new study covers the dramatic expansion of the press from the seventeenth century to the mid nineteenth century. 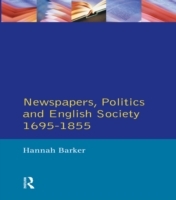 Hannah Barker explores the factors behind the rise of newspapers to a major force helping to reflect and shape public opinion and altering the way in which politics operated at every level of English life. Newspapers, Politics and English Society 1695-1855 provides a unique insight into the political and social history of eighteenth and nineteenth century England as well as an important study of the history of the media.